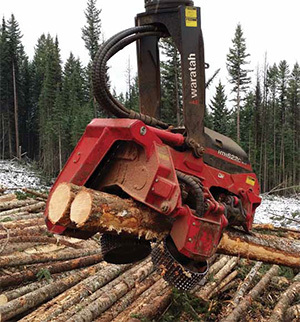 Waratah’s new 622C 4x4 multi-tree processing head with four roller drive is getting solid praise from the folks at McNeil and Sons Logging in the B.C. Interior. Performance is persuasive—and Waratah’s new 622C 4x4 multi-tree processing head is proving its effectiveness in the bush, getting the job done where it counts. 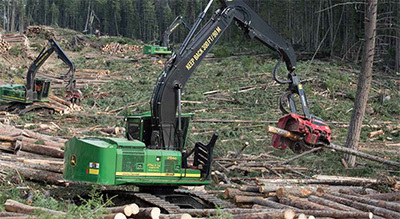 The harvesting crews with B.C.’s McNeil and Sons Logging have seen for themselves what the 622C head can do in both multi-tree and single stem processing applications. The 622C four roller easily pulls in the larger wood and increases feed speed, he added. Stem size uniformity is not a multi-stemming prerequisite for the 622C. “One really great thing about the 622C is that when multi-stemming, the trees don’t all have to be the same size,” he said. Part of that is attributable to Waratah’s unique auto stem alignment system coupled with a shuffling feature for independent log driving that limits trim waste when multi stem processing. Steve Tresierra of logging contractor McNeil and Sons is a big fan of the new Waratah 622C head with its four roller drive. 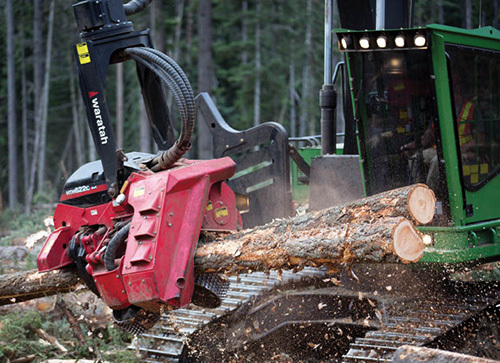 The 622C four roller easily pulls in the larger wood and increases feed speed. “It’s excellent,” says Tresierra. “In small to medium size wood, multi-stemming is the way to go and definitely boosts our productivity. Even in the bigger wood, where you would want to single stem more, the extra power in the head really goes a long way to contributing to the speed and smoothness of operating the machine,” continued Tresierra. Tresierra reckons processor operators familiar with the Waratah 622B will encounter few problems getting comfortable with and getting the most from the 622C 4x4. “If you’re familiar with the 622B, then it’s best to just have some fun with the new head for the first little while, let it show you what it can do,” he recommended. The pair delivers an additional advantage. “Our 2154D with the 622C has increased our production a lot, but the fuel efficiency seems pretty comparable to our other (excavator) machines. You get more trees processed using the same amount of fuel,” explained Tresierra. 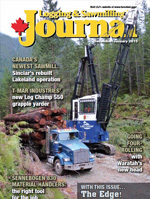 “Our little company has always tried to keep up with technological changes,” pointed out John McNeil, a partner in the family-run log harvesting and hauling company which traces its forest industry pedigree back into the 1950s. These days, McNeil and Sons Logging is not exactly the “little” company McNeil described. It’s followed the trend of licencees opting for fewer and larger log harvesting contractors. Latterly, McNeil and Sons has been harvesting about 350,000 cubic metres a year for West Fraser Timber, sending volumes to the company’s processing plants in both Chasm and 100 Mile House. McNeil and Sons teamed the Waratah 622C to a John Deere 2154D, a 21 ton class excavator well suited to the 4x4 head which is heavier than the 622B. "Our 2154D has enough flow to provide the power that the 622C head needs,” says Steve Tresierra. “They're a great combination together." McNeil and Sons operates 20 pieces of logging equipment to produce its volumes. The fleet includes three Tigercat 870C bunchers, a Cat D8 dozer, four Deere 748H skidders, a Deere 850J dozer, four Deere 2154 log loaders, a 2154 and a 2454 Deere roadbuilder, and five John Deere 2154D processors with Waratah heads. “The idea of multi-stemming has always interested us. And especially so now when we’re often operating in .2 cubic metre piece sizes,” noted McNeil. The log processing function generally—and how efficiently it’s being performed specifically—is really important to the mills, he added. For that reason, the process has always been under McNeil and Sons microscope as it strives to find ways to improve. In 1998, for example, the logging contractor put a couple of the Lim-mit delimber processors from Risley Equipment through their quality control paces. More recently, McNeil tried more than one new processor brand before deciding on the 622c 4x4. McNeil and Sons complements its log harvesting activities with a log hauling side. The company runs eight of its own logging trucks—five Freightliners and three Western Stars—and sub-contracts six others from regional owner operators. 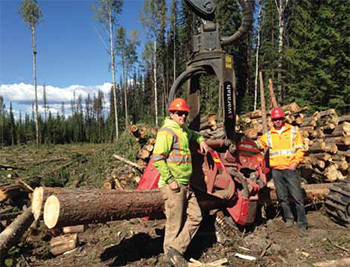 When the Logging & Sawmilling Journal visited, McNeil and Sons logging crews were working on various cutting permits about 70 kilometres east of 100 Mile House, near Bowers Lake. The Waratah 622C on the JD 2154D were proving what they could do and helping make converts of the crew. In total there were about 135,000 cubic metres in the area scheduled for harvesting and delivery to West Fraser mills. The 100 Mile region encompasses a diverse range of biogeoclimatic zones and harvesting conditions. But McNeil has few concerns about the 622C/2154D combination’s versatility under differing operating and ground conditions. In winter, company crews are often assigned wetter ground with bigger diameter wood; conversely in the summer, it’s typically smaller wood and drier sites. McNeil reckons the 622C has got what it takes to get the right quality of wood processed on the ground for the company—wherever they’re operating. Waratah’s HTH 622C 4x4, four-roller processing head was designed with input coming directly from B.C. loggers working alongside Waratah’s regional and overseas engineering teams. “We studied B.C. licencee field results for multi-tree processing and it was evident from contractors and licencee feedback that what was often being gained in productivity through multi-tree processing was also risking or leaving the quality aspect behind,” said Rob Agassiz, North America Operations and Distribution Manager for Waratah. “Our customers approached us for a 622 model that would do everything our 622B model can do for single stem productivity and quality, but coupled to a level of multi-stemming capability where contractors have a stronger chance of being able to meet saw log quality specs for lengths and diameter,” said Agassiz. “Our customers requested this new head be capable of feeding a larger diameter range of stems when multi-stemming. “At the same time, they wanted the ability to push the envelope in handling peelers and large log sorts while matched to a 21 ton carrier to minimize capital cost and maximize fuel efficiency,” added Agassiz. The 622C has a number of new innovations including eleven new patents pending, said Agassiz. New features like two stem-diameter readout on the display during multi-stemming means an operator does not need to guess on the two separate stem diameters, and provides individual log volume recording. The head’s dual photo eye-independent find-end feature uses an industry first laser technology in tandem for find end of either multi-stem logs or single stem applications. The dual laser design does not need to be cleaned for upwards of 400 hours. Waratah’s automated shuffling mode is a step forward in traditional independent log driving capabilities, said Agassiz. This patent pending feature allows a one button push for auto alignment of both stems (using the dual lasers), and then drives both trees automatically to the target length. In addition, a new 622C hydraulic valve was designed to enable the drive arms to pendulum to maintain traction even with two stems of varied diameter; this allows the 622C to be run optionally without a drive arm link. The head is 800 lbs heavier than the Waratah 622B 3 roller model. 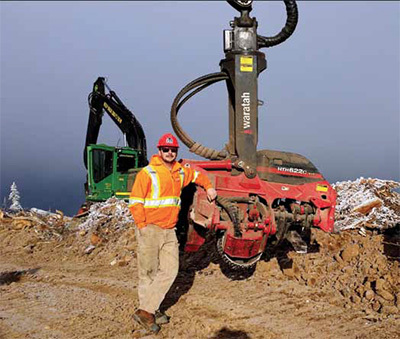 The 622c 4x4 is coupled to a long list of standard features including Waratah’s 3/4 pitch main saw unit with automatic chain tensioning, and the 360 continuous rotation rotator which facilitates increased operator control and productivity, says the company.